Yea for me I guessed the chocolate cake! Now for my prize, I'll go make it. Great idea for a prize, Mimi :) You deserve it. How could you go wrong with chocolate and coconut indeed! sounds great :)(and I'm very glad it was the winner b/c I thought it sounded really good). This sounds fabulous! I especially like the cake mix part. It's kind of like a German Chocolate cake, isn't it? I make BD cakes for the people in my husband's office - I think they'll get this cake next time! Mmmm, Karenpie, I can picture it now. With chocolate/coconut glaze. Maybe some chopped pecans sprinkled on top. Oh, and thanks for feeling my pain when it came to my lost post. I'm going to re-write it tomorrow. Cake? Always the winner in my book. Sounds delicious! I guessed the potatoes, so I was half-right! ;) Everything looks incredible! 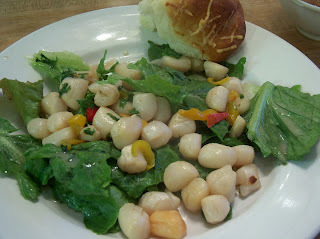 I was leaning toward the scallops since March 12th was National Baked Scalloped Day and because I am so craving a great dish of scallops. But, your scallops aren't baked... However, hands down, the oozing Chocolate Bundt Cake with Coconut-Cream Cheese is calling my belly's name. Listen, "Oh belly" what's that you say, none left; Uh Oh!!! thanks for looking at my recipe. the next one I was planning to post is called a No Tears Chocolate Cake (made up that name) and it looks like your Chocolate Bundt. Hey Lynn!! I was happy to get your comment on the my blog! I'm still hanging around...just not active at all on the internet. :) But i really do appreciate your comment...so glad y'all enjoyed the freezer pickles. We love them too. I'm anxiously awaiting spring's arrival so i can get going in the garden again. I can hardly wait to get out the canner! I canned some whole hog sausage a few weeks ago...I know...I know...not healthy, but oh so good! :) Isn't that what counts???? please tell me it is!! LOL! Anyway, thanks so much for letting me know how you enjoyed the pickles. they all looked delicious to me! Mmm the cake does sound good...although I'm kind of in the mood for a late night potato snack myself. LOL. The potholder. Definitely the potholder. fun post, they all look like winners to me! I was wrong. Le sigh. Hey Lynn! This was totally my first time doing BSI too. Your soup looks good; I love all things involving carrot. And that cake? Mmmm. 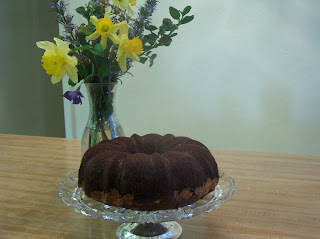 My grandmother makes the most amazing chocolate chip bundt cake, so naturally, I adore bundt cakes of all types. Yum! I guessed the Bread Sticks but I love 'em so I would pick them over anything else! Thanks for the info on the Gratin Dauphinois, I'm making this for sure! Hey Lynn, thanks for stopping by my blog! I really don't know what I was thinking buying those chemical-filled preserves! I think I will stick with the homemade huckleberry I have from last summer. Silly me! Your blog is great! So many fantastic recipes! I will definitely add you to my reader. Have a great day! I guessed the crocheted potholder. Oops. Your house must always be filled with warm delicious smells--how nice. My mouth is watering over this cake. I have a similar recipe... but without the coconut. Be still my heart!!! You know from what you said this was a pretty good week for you except for the breadsticks everything was good. The chocolate bundt was just better. The bunnies are back today! I was hoping the bundt cake would win!!! Really wanted that recipe. It will make me look like I put some thought into it, the next time I have to bring desert to a family gathering. Thanks in advance for making me look good!